Change the color scheme of the template with whichever you prefer. This service is completed within 24 hours by our Service Center. - Banners and slides update. - 5 CMS pages creation. An Exclusive License ensures that you are a sole buyer/licensee of the template. You are granted an exclusive non-transferable permission to use the template on multiple domains. Knives are more than a weapon or a tool. A well-made and decorated knife can be a piece of art or a symbol of your status. Yet, for any man, it always will be a favorite toy. Especially when it comes to hunting and fishing. Moreover, knives can be a profitable business. 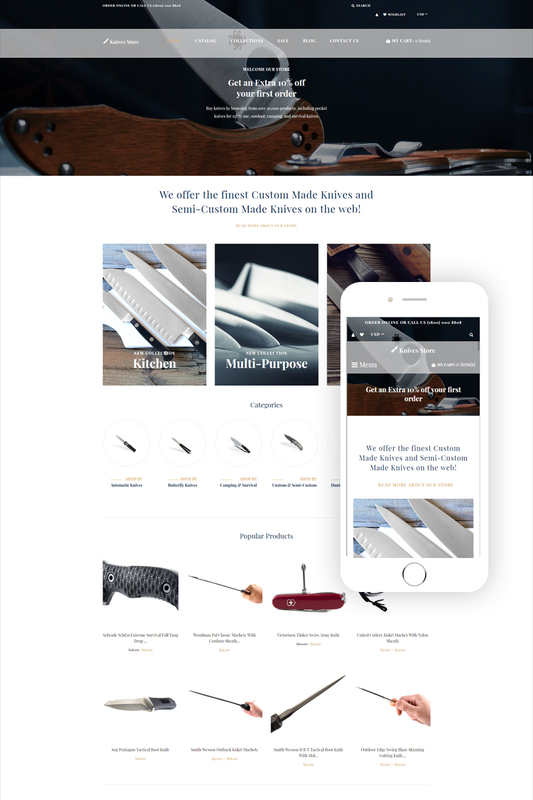 And if you want to start a knives store than you have to check Knives Store Shopify Theme. It has full Shopify e-commerce pack with cart, wishlist and currency options. These features provide customers with comfortable shopping. It also has eye-catchy and easy to edit the design. It was developed as an e-commerce website and includes Catalog, Sale and Collections category pages with many included product pages. In addition, you can provide customers with various types of products. Besides knives, you can sell axes, blades, tools, and many other items.